Nature’s Two Acres Part XXIX: Cold-blooded carnality… Or, why be warm blooded? In mid-to-late spring, western pond turtles go in search of mates, which may explain this turtle’s wandering. 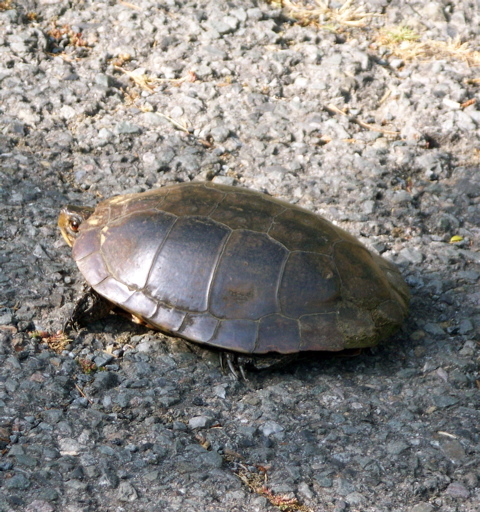 Notwithstanding their name, western pond turtles are usually found around slow-moving bodies of water. By creating stockponds, however, ranchers have now provided many pond turtles with actual ponds for habitat. This is good because the western pond turtle is on the federal government’s list of threatened species. There’s no shortage of them in Northern California, but they have mostly died out in Washington and British Columbia. 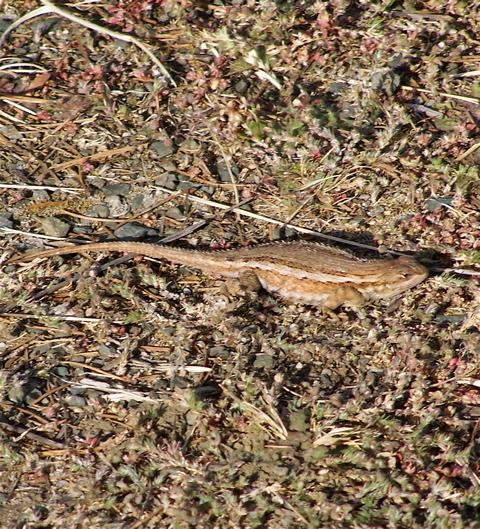 More cold-blooded carnality in the road: I found this western fence lizard in my driveway Tuesday. Her courtship having already concluded, she may be carrying as many as 17 eggs. Around eight would be more typical, but her condition appears so gravid my guess would be higher. 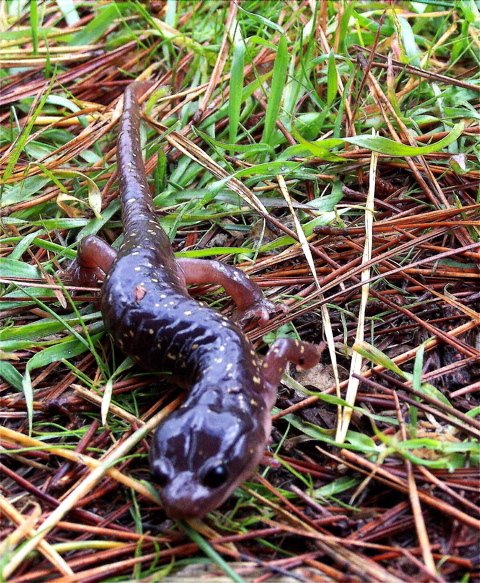 California newts, meanwhile, are reaching the end of their mating season. 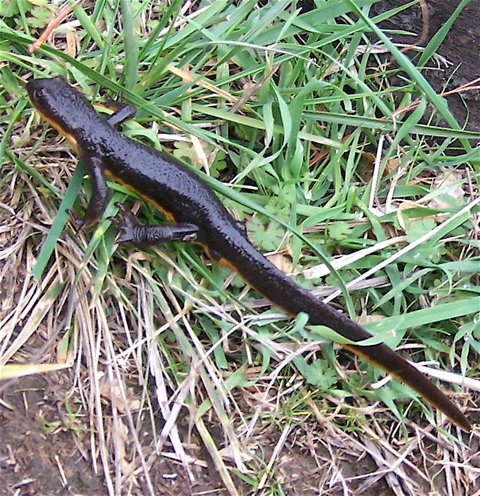 The skin of a newt such as this secretes a neurotoxin, tetrodotoxin, that is hundreds of times more toxic than cyanide. Newts, by the way, are amphibians. Other amphibians native to West Marin include salamanders, red-legged frogs, and Pacific tree frogs such as this. 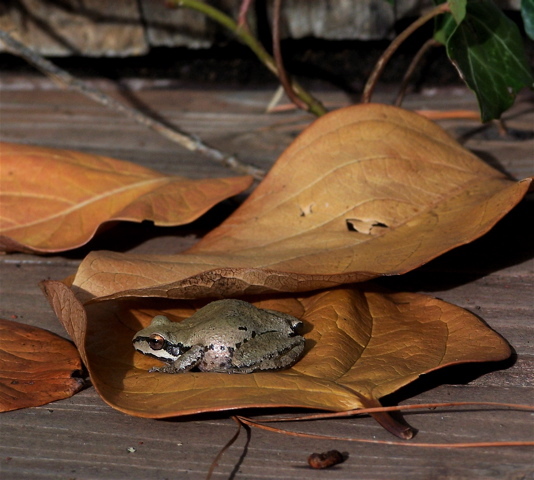 Female tree frogs in West Marin are nearly finished laying this year’s eggs, which hatch in three to four weeks. Tree frogs depend largely on camouflage to escape predators. Notice how the facial stripe hides this frog’s eyeball. In addition, the frog’s color changes as it moves around. But unlike the chameleon, which changes its color to match background colors, the Pacific tree frog’s color depends on how moist or dry its location is. 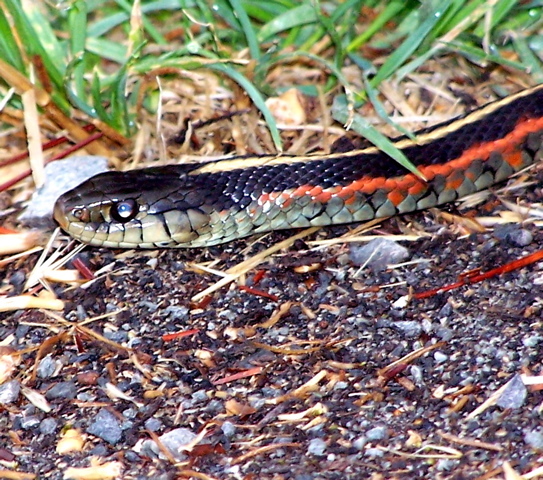 This garter snake is warming himself on my driveway. 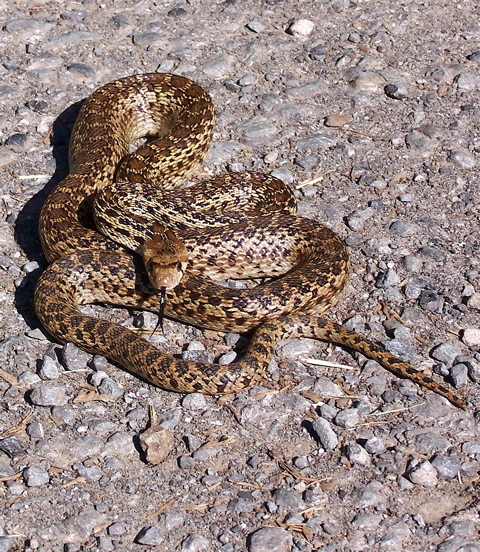 Like lizards and turtles, snakes are reptiles, and both reptiles and amphibians are characteristically cold blooded, which raises a couple of questions. Why are some animals cold blooded? Are there any advantages to it? “Warm-blooded creatures, like mammals and birds, try to keep the inside of their bodies at a constant temperature. They do this by generating their own heat when they are in a cooler environment, and by cooling themselves when they are in a hotter environment. “To generate heat, warm-blooded animals convert the food that they eat into energy. They have to eat a lot of food, compared with cold-blooded animals, to maintain a constant body temperature…. 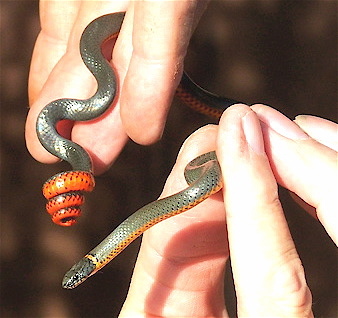 “Cold-blooded creatures [like this Pacific ring-necked snake I found in a rotten log] take on the temperature of their surroundings. They are hot when their environment is hot and cold when their environment is cold…. Cold-blooded animals often like to bask in the sun to warm up and increase their metabolism…. “There are many advantages to being warm-blooded. Warm-blooded animals can remain active in cold environments in which cold-blooded animals can hardly move…. “Warm-blooded animals can… seek food and defend themselves in a wide range of outdoor temperatures. Cold-blooded animals can only do this when they are warm enough…. Cold-blooded animals also need to be warm and active to find a mate and reproduce…. “Being cold-blooded, however, also has its advantages. Cold-blooded animals [like this arboreal salamander] require much less energy to survive than warm-blooded animals do…. It occurs to me that all this may have implications for coping with mankind’s energy crisis. The cold-blooded approach would be for everyone to consume less but be less active in order to get by on less energy. The warm-blooded approach would be to keep consuming in order to stay warm, safe, and active, but this requires continually finding new sources of energy. When you file ’em together, which class are you in? Sparsely Sage and Timely is powered by	WordPress 4.9.10 and delivered to you in 0.492 seconds using 50 queries.